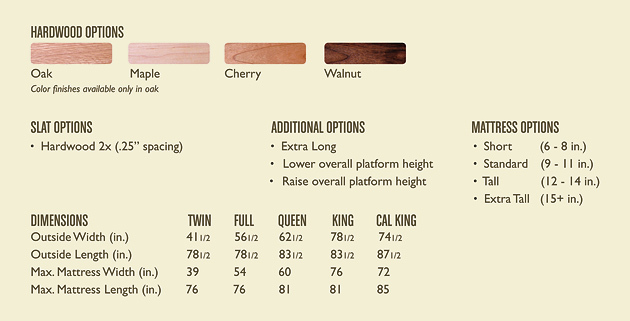 Wood Beds |Wood Bed Frames| The Organic Mattress Store® Inc. The Organic Mattress Store has been selling this company for 15 yrs.When you’ve found the perfect organic mattress on our site, or in our store, you will need a solid wood bed to match…and it would be hard to find beds of better quality than the natural wood beds below. All of these beds are crafted of solid North American Ash, Cherry, Walnut, Hickory, Quarter sawn Oak, Elm, and beautiful Brown and Hard Maples, and all are magnificent hardwoods with beautiful grains. All of these models are hand-sanded for a fine finish. Organic Stains are standard on most beds. 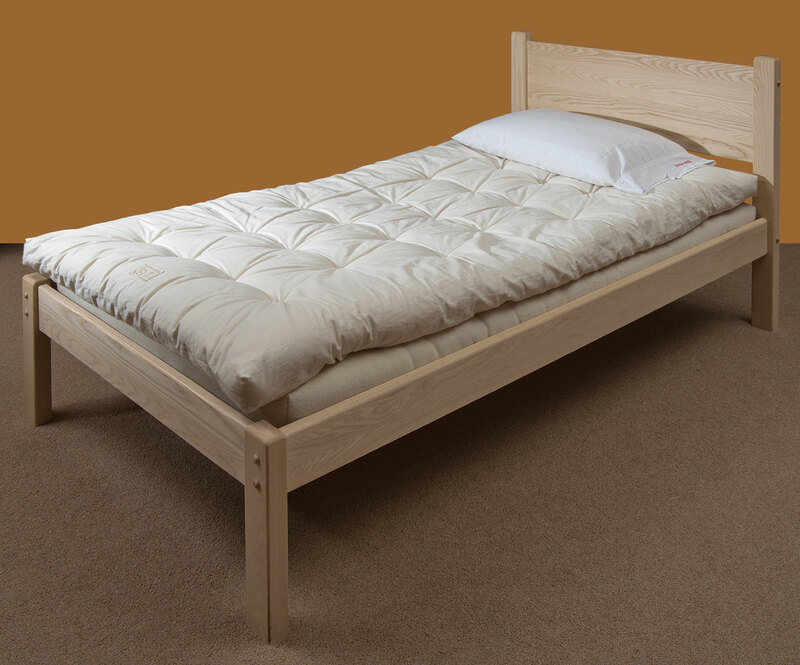 All of our beds are solidly constructed, durable, with metal on metal connectors for good strength and easy assembly, and our hardwood slats are also the strongest around. These beds are easy to assemble and disassemble when moving. We know that you want a choice, so our bed frames are offered as either conventional (use a mattress and box spring) or platform bed (use mattress only). Simplicity in design and manufacture, makes this bed at home in any decor. The Freeport is made of solid North American Ash, and its laid back style will blend in with whatever your room looks like. It features solid hardwood slats for excellent mattress support, and metal-on-metal connection frame assembly for longtime durability. This beautiful panel bed with a headboard is just the right height. Its perfect for any bedroom when you’re reading or watching TV, or just reading a book. 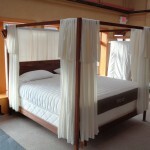 This bed is made of solid North American Ash, a superior hardwood with a very nice grain. The Sedgwick is hand-sanded, and then finished off with a five-step finish process. 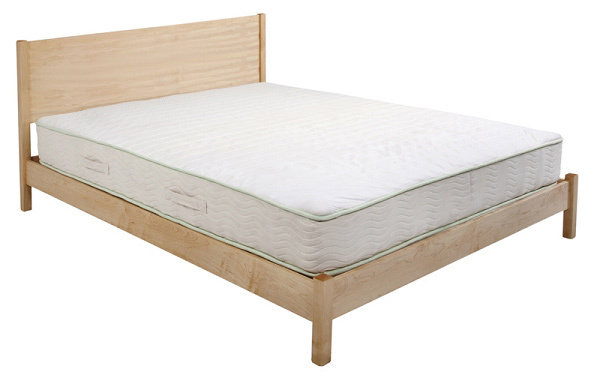 The manufacturer adds in solid hardwood slats for quiet mattress support (They never use pine because it’s too soft). This Timber Ridge wood platform bed has 5″ rails and lower crosspieces and is available in genuine solid American Red Oak, Brown Maple,Rustic, or Plain Cherry and Walnut. The Timber Ridge headboard panel is 24″ and allows the bed to be used with thicker mattresses. Each bed has a natural linseed oil finish added. Linseed oil is environmentally friendly and the natural oil is extracted from dried flax seeds. 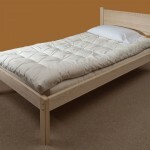 Today, solid wood beds made from real wood like this bed are becoming very hard to find. There are also many more options you can choose to customize your bed which make this wood bed the perfect choice for any bedroom. 10-Year Manufacturer Warranty. Made in the USA.